A worldwide distributor of high-quality stainless steel products. In the past 10 years, Poliviar has focused on quality and design. We are dedicated to delivering high quality products at the very best value. Our goal is to creat products that richly improve the lives and health of our clients. We desire to manufacture safe products using environmentally friendly materials. * All Poliviar products adhere to FDA food-safety standards. * Constructed of high-grade 18/8 stainless steel to ensure rust and corresion resistance; allowing years of continuous use with no fading over time. 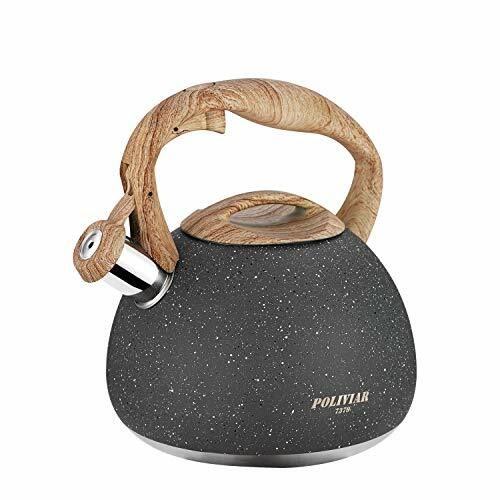 [Anti-Rust & FDA APPROVED FINISH]: Stylish tea kettle electroplated for longevity. Professional food grade finish and 18/8 stainless steel craftsmanship,ensures this kettle is rust & corrosion resistant. You will enjoy years of continuous use with no fading over time. Every surface exposed to the water and food particles is certified as food grade safe. [LOUD & AUDIBLE WHISTLE]: The automatic whistle is loud enough so you can hear the whistle with plenty of background noise. The whistle on this kettle will grab your attention while you are focused on other issues such as housework, movies, or games at the same time. Simple and time saving with no stress. [SIMPLE-TOUCH BUTTONS WITH HEAT_RESISTANT HANDLE]:Silicone coated handle allows you to grab the tea kettle with bare hand without risking burns. The ergonomic shape and design maximaze your comfort to lift, pour and fill.Simple-touch button provides easy open & close and makes one hand pouring possible. [FAST-HEAT BASE]: This tea kettle is designed with a generous 8 inch base that maximizes heat conduction. Our self-sealing lid offers a 100% seal to increase the efficiency of boiling.High-grade 18/10 of stainless steel is suitable for any heat source including gas, electric, induction, halogen and radiant stoves. [SATISFACTION GUARANTEED]: Poliviar is committed to providing our consumers the absolute best price and quality on our entire line of products. All of our products qualify for a full 12 month warranty. Our service team provides premium service to help solve any problem.